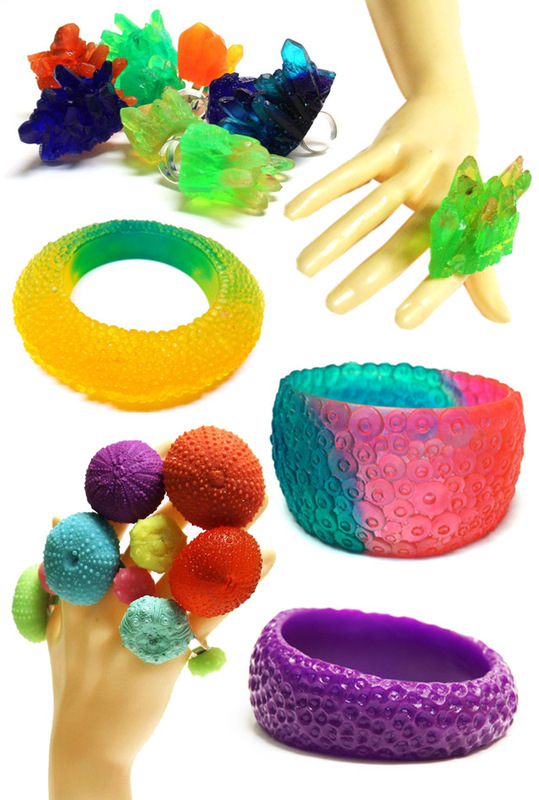 Mysterious undersea life and translucent crystals are among the main themes of Serena Kuhl's jewellery. All her pieces come in the prettiest and brightest colours you can imagine. It's amazing how this jewellery shines in the sunlight and it's the perfect addition to any happy outfit. All jewellery is designed and produced by Australian designer Serena Kuhl personally. The material of her choice is resin. It's an extraordinary material, easy to care and pleasant to wear. Serena is open for custom orders, if the perfect piece is not available in the colour of your dreams for example. Good news for the plus size girls among you too: There are some plus size bangles ready too. I really can't name a favourite from Serena Kuhl's shop. All the pieces are amazing and I think they look best, if you combine a few of them. Due to the very reasonable prices, you don't have to hold yourself back. I'll keep you updated about my first Serena Kuhl pieces for sure. What is your favourite? Discover all the resin treasures of Serena Kuhl and visit her shop and like her on Facebook. Ich bin eh von dir und deiner Mode fasziniert : D aber das weißt du ja schon, denke ich ^^.